When we look at the recent rise for equities, we want to know how that move is occurring. If it is “too fast” then there may be a need for the market to cool off a bit before the next leg higher. Then again, perhaps the move was simply a bounce off of lows that will reverse. 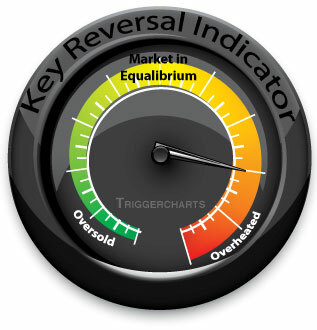 Either way, the Key Reversal Indicator tells us that markets are getting frothy again and the likelihood of a reversal within the next couple of days is increasing. Currently, the KRI is at a +4 level. Above this is critical as history has shown us that when the levels is above +4 or below -4 that a change of direction is forthcoming. The overall market, as measured by the KRI algorithm, is nearing a critical level of being overheated. Caution on the long side should be observed as a reversal of trend may be nearing. Continue to evaluate long positions, tighten stops and consider reducing long exposure or hedge out risk over the near term.